What walks on four legs in the morning, two legs in the afternoon, and three legs at night? Cue the drummer’s rim shot followed by a bass drum thud. Then give the philosophical riddle a thought or two about how we begin our lives by moving cautiously, move into the fast lane for awhile, and then settle down later on with experience at our side. Along the way we hope to absorb and understand as many special impressions as we can. Alto saxophonist Mark Gross takes us on a journey of ancient Egypt. Recorded in April 1999 the session combines a terrific rhythm section with the exciting interplay of vibraphonist Joe Locke and pianist Mulgrew Miller. Both contribute lyrical interludes that complement the saxophonist’s energetic drive and enhance his impressionistic passion. While the thirty-something native of Baltimore, Maryland shows allegiance to John Coltrane, Cannonball & Nat Adderley, Johnny Hodges and Kenny Garrett, his distinctive tone and artistic paintbrush offer much to characterize the individual. Wayne Shorter’s "Black Nile" swings hard in a straight-ahead piano trio setting colored by exotic sounds from the udu drum. The familiar jazz melody echoes from alto saxophone with world wise overtones that paint appropriate landscapes. Julian "Cannonball" Adderley’s "Marabi" leaves impressions of native dancers and streetwise snake charmers, but with a calypso twist. Billy Strayhorn’s ballad "Isfahan" receives a straightforward approach, while Gross’ five compositions weave ancient Egypt around modern jazz. 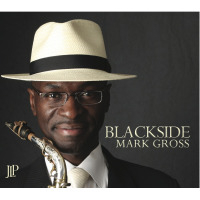 Highly recommended, Mark Gross’ latest album provides a tonal picture worth much more than a thousand words. Track Listing: Valley of the Dry Bones; Moses in Egypt; Eastern Joy Dance; Lullaby of Isfahan; Riddle of the Sphinx; The Desert Sands of Cairo; Black Nile; Isfahan; Marabi; The Red Sea. Personnel: Mark Gross- alto saxophone, soprano saxophone; Mulgrew Miller- piano; Brian Blade- drums; Darryl Hall- bass; Joe Locke- vibraphone, marimba; Khalil Kwame Bell- percussion; John LaBarbara- oud on "Valley of the Dry Bones," "Marabi" and "Riddle of the Sphinx."